2018-19 Board of Directors (from left to right): Vice Chair Tom Siemens, Secretary Marcia McNeil, Treasurer Angus Izard, Donnie Wing, Ruth Mogensen, Island Health President and CEO Kathy MacNeil, Chair Steve McKerrell, President & CEO Melanie Mahlman, Dr. Elin Bjarnason, Past Chair Bruce Dyck, Dr. Alan Winter, and Charlie Robinson. Not pictured is Brenda Nunns Shoemaker. Our Board of Directors is comprised of our community’s leaders dedicated to making a difference in healthcare. 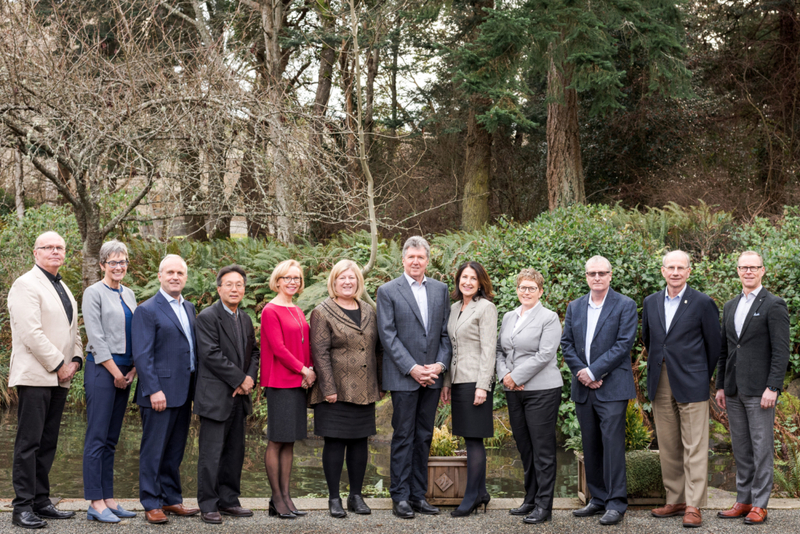 The Victoria Hospitals Foundation is grateful to have an inspired and engaged Board of Directors. Their dedication, expertise, and commitment to helping our organization is deeply inspiring. Every Board member has a unique reason why they are compelled to support and to serve with us. Browse their bios to learn more about this important group within the Victoria Hospitals Foundation team. Steve McKerrell spent more than 20 years as Executive Chairman of one of Canada’s leading health supplement companies, following a career in the remote sensing industry, and is currently involved in the development of personal electronic healthcare devices. Mr. McKerrell is a recipient of The Sovereign’s Medal for Volunteers, having served his community as a volunteer on numerous boards and committees over the past 3 decades. In 2014, Steve completed eight years with the Victoria Foundation including two years as Board Chair. He currently also serves on the boards of the United Way Greater Victoria, and as chair of the Foundation for the Victoria Symphony. Mr. McKerrell has lived in Victoria since 1990 with his wife Barbara. He has two adult daughters, Tricia in Calgary and Dianne in Victoria. He joined the Victoria Hospitals Foundation Board of Directors in 2015. Mr. Siemens joined RBC Royal Bank in 1982 in Winnipeg, Manitoba. His career has encompassed roles across a broad range of disciplines and customer bases, in a wide variety of locales, including Winnipeg, Calgary, Toronto, Saskatoon and Victoria. Mr. Siemens has served on the Campaign Cabinets of the Greater Victoria Hospitals Foundation and the Strategic Advisory Committee for Ballet Victoria. He has been involved with both the United Way and Junior Achievement throughout his career and was Chair of the United Way of Greater Victoria’s 2006 Campaign. He served as Past-Chair on the 2007 United Way Campaign, and as a Member-at-large for the 2008 and 2009 Campaigns. More recently, Mr. Siemens served as a member of the Camosun College Board of Governors, serving as Chair of the Finance & Audit Committees, and as a member of the Board of Advisors, Faculty of Business, University of Victoria. He is currently on the Board of Directors of Pacific Opera Victoria, serving as Treasurer, and is a member of the Greater Victoria Advisory Board of The Salvation Army, and the Catholic Foundation of Vancouver Island. Mr. Siemens holds an MBA from the University of Manitoba, together with designations from the Institute of Canadian Bankers (ICB) and the Canadian Securities Institute (CSI). Mr. Siemens resides in Victoria with his wife and they have three adult children. He joined the Victoria Hospitals Foundation Board of Directors in 2018. Marcia McNeil is a partner with boutique law firm Sheen Arnold McNeil and has practiced in the areas of labour, employment and human rights law for more than 25 years. Representing clients in the private and public sectors, Ms. McNeil has appeared before British Columbia’s Supreme Court and Court of Appeal, as well as before administrative tribunals, including the provincial and federal Human Rights Tribunal, labour arbitrators and the BC Labour Relations Board. Ms. McNeil has been recognized annually in Canadian Legal Lexpert Directory in employment law since 2012. She was the Chair of the BC Industry Training Appeal Board and the Vice-Chair of the Community Care and Assisted Living Appeal Board of British Columbia. She was also a sessional lecturer in Employment Law at the University of Victoria in 2013. She joined the Victoria Hospitals Foundation Board of Directors in 2015. Mr. Izard is a founding partner with the accounting firm Cameron Izard Snell. His primary areas of focus include providing tax and business advice for businesses and high net worth individuals. He joined the Victoria Hospitals Foundation Board of Directors in 2013. In the role of Vice President – Clinical Service Delivery, Dr. Elin Bjarnason oversees all aspects of clinical operations and is responsible for establishing, developing and operationalizing an effective integrated care delivery model across Island Health. Working in partnership with the VP – Priority Populations & Priority Initiatives and the VP – Medicine, Quality and Academic Affairs, Elin provides leadership for the implementation of strategic initiatives and ensures operational plans are carried out to provide efficient and effective delivery of health care services across Island Health. Elin came to Island Health in 1986 from Winnipeg, Manitoba, and has over 30 years of health-care clinical and leadership experience. Prior to this position, Elin’s previous roles included Interim VP – People & Experience, Interim Executive VP – Quality, Safety and Experience, Executive Director for Integrated Health Services (Geography 4), as well as a number of executive director and director roles of operational and quality programs and site administration roles at Island Health. Throughout her leadership career she has been a keen advocate for improvement at the local and system-wide levels. She joined the Victoria Hospitals Foundation Board of Directors in 2018. Mr. Dyck served as the President of the Chew Group of Companies from 1990 to 2014 (retired). The Chew Group has a total annual volume of approx. $15 to $20 million. Mr. Dyck has served on various boards within the industry and the community. He has served as the Chairman of the Island Equipment Owners Association, Chairman of the Rock Bay Landing Liaison Committee and a committee member of the BC Roadbuilders Association. Mr. Dyck was also part of the successful Facility Study and Capital Committee for the Burnside Gorge Community Association. Mr. Dyck received his Bachelor of Arts, Economics (Honours), at the University of Victoria. He joined the Victoria Hospitals Foundation Board of Directors in 2014. Ruth Mogensen is a retired Human Resources executive with over 20 years’ experience as a leader in human resource management. She has held senior roles with IBM Business Consulting and Price Waterhouse Coopers and has also held human resource positions in the oil and gas industry, post-secondary education and legal sector. Ms. Mogensen is a Master Coach and facilitator and is skilled in succession planning, recruitment and retention strategies, compensation and performance management. She brings a wealth of experience in all aspects of employee relations and holds a Bachelor of Science from the University of British Columbia. She holds a CHRP designation. She joined the Victoria Hospitals Foundation Board of Directors in 2017. Brenda Nunns Shoemaker is a retired healthcare executive. She was the Vice President of two teaching hospitals in Ontario, the founding President of the Canadian Association of Pediatric Health Centres and President of the Ottawa General Hospital Foundation. She served for nine years on the Island Health Board of Directors, including several years as Chair of the health quality committee. She was the recipient of the Queens Golden Jubilee medal for voluntary service. Ms. Nunns Shoemaker has been on several boards at the local and national level, in the fields of education, athletics and health. She currently serves on the Board of Directors of the Victoria Airport Authority. She was also a consultant and faculty member of the Canadian Patient Safety Institute and the Canadian Foundation for Healthcare Improvement. Charlie Robinson is a respected, results-orientated and driven IT Executive with diverse delivery and sales expertise in application services, business process outsourcing, governance, and systems integration. An architect of technical and business solutions and I.T. outsourcing/co-sourcing, Charlie is accomplished in delivering innovative strategies to improve delivery performance. He is experienced in acting as the conduit between technical and mainstream business operations at multiple levels in a governance construct. Charlie is recognized as an industrious, motivational leader who rallies the senior team and staff to meet corporate goals and objectives within highly competitive environments. Skilled in best practices, he has helped many c-level clients adapt to changing delivery models, technology changes and market pressures. He is an articulate, tactful and diplomatic negotiator, highly skilled in project management, program management and service delivery. Charlie is recognized as a relationship builder who coaches and stands behind employees to motivate and instill the confidence to succeed. Mr. Wing is a seasoned executive with extensive knowledge in insurance, investments, finance, strategy, policy, privacy and government relations. He was CEO of Healthcare Benefit Trust for five years and also served on their Board of Trustees. He also served as a member of the ICBC executive team for 12 years and as a Senior Policy Advisor and Acting Director for the Province of B.C.’s Crown Corporations Secretariat. Donnie has given back to the community serving on the board for S.U.C.C.E.S.S., one of the largest social service agencies in B.C., for five years in various capacities, most recently in the role of Chair of the Board. Known for his collaborative working style Donnie is also very familiar with the Victoria community and pleased to join the board of the Victoria Hospitals Foundation. Dr. Winter was the President and CEO of Genome British Columbia, the founding President and CEO of the New Media Innovation Centre in Vancouver, the President of the ComDev Space Group in Ontario, and the President and CEO of MPR Teltech Ltd. in Vancouver. Dr. Winter has wide experience at senior levels in the technology sector and in government. Alan is currently a director of Ontario Genomics, Geoscience BC, Oceans Network Canada and a member of UBC’s Research and Innovation Council. In 2007, he received a Leadership Award from Life Sciences BC (LSBC). In 2017, he received the Don Rix Award for Lifetime Achievement from LSBC and the Bill Thompson Lifetime Achievement Award from the BC Technologies Industries Association (BC TIA). He joined the Victoria Hospitals Foundation Board of Directors in 2017.